Lighting-Gallery-net - Incandescent - General Service 25-100 watt/GE Standard 60w bulbs from 1970. 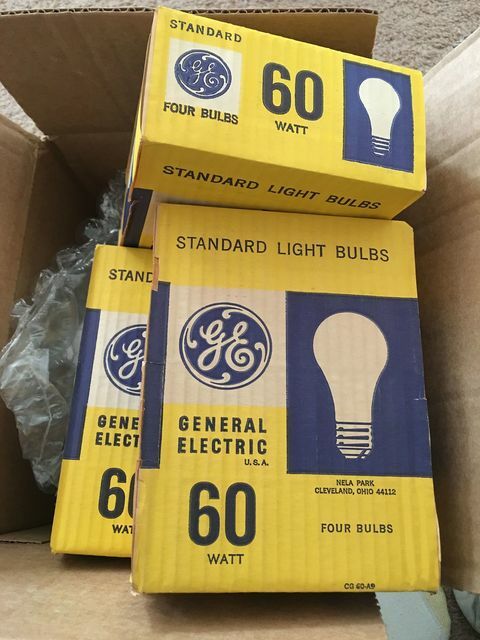 GE Standard 60w bulbs from 1970. Classic! Got these from a seller in Rhode Island. WOW!!!! Those are MINT, Dave! In the days when we had REAL bulbs, not LED trash. I have to laugh about people (...)ing how "inefficient" incandescent bulbs are, yet we use them mostly during winter when it is cold, and they give off heat that is welcome, and before anybody tries to tell me the heat output is too low to be useful WRONG! If you don't use incandescent you pay more for fuel to heat your house, and I have a Christmas tree in my music room with perhaps 150-200 watts max worth of genuine C-6 series antique lights on it, and when it is chilly down there, I turn them on, on a dimmer of course to preserve the bulbs, and the room goes from 60 degrees to 75 degrees in perhaps a half hour to 45 minutes. The "waste" heat is very useful. And sorry, but running bulbs is cheaper than paying for 5 cent a gallon actual WORTH heating oil they blatantly charge almost 3 bucks a gallon for! It is MAX a 5 cent a gallong product, gasoline max 10-25 cent a gallon product, so I'd rather pay to run incandescents than save a mere few cent a month on the electric bill running LED's the contribute little to nothing to reduce heating bills, last even less than incandescents because they are solid-state GARBAGE! If the power line spikes one volt over 120 they over volt and fry. And we need more sleep in winter and LED's kill circadian sleep rhythms, so yeah, I want my "inefficient" incandescent bulbs! Looking at these, you can see how far Greedy Extortionists (GE) have gone backwards, today's LED and halogen bulbs look like the Chinese made TRASH they are, and they have the NERVE to charge big $$$ for halogens that burn out in 350-500 hours and LED's that burn out instantly to 300 hours. Don't even TRY to return one if it is defective, you will get the cold shoulder. Heck, even the packaging was well made back then--the sleeve is better quality than any of the BULBS made today, and that is sad. I forsee all LED bulbs becoming ridiculously overpriced, even more than now, unreliable, with actual life ratings of 750 hours or less, glary, dank nasty things thet only come in 6000-7500 K color temperatures that make your house look grey, dingy and depressingly dreary. Once they are the ONLY light source it will be open season to see who can make the shortest life ones and the ugliest looking ones, like today's buildings and cars, household appliances, etc, and how high the prices charged for them will be. Then, unless Trump stops it, and I hope soon, they will also ban the use of any old stock bulbs we hoarded, and make it illegal to even own them, fining (READ---TAXING!) you for EVERY incandescent bulb in your house, working or not, from tiny grain of wheat and miniature flashlight and automotive bulbs to chandelier and appliance bulbs to Christmas and decorative bulbs to GLS bulbs, and they will ban collecting or preserving old bulbs because of "the probability some might actually get used and violate the energy efficiency laws" and unless you give up your lifelong bulb collection you will be arrested for a "crime" akin to manslaughter. If we go ALL LED you can BET some lib-tard snowflake in government or some corporate entity that makes LED "bulbs" for lack of a better word, will pass that kind of a law, even if the corporations have t pay to get it passed. I know it sounds far out, but look at the crap happening now, and I have been informed that the bulb ban will be extended to cover ALL incandescent lamps, all HID and all fluorescent, and that includes vintage and hoarded ones, and stiff fines are to be imposed for those who don't obey the regulations. SO--don't EVER think your collections of vintage/rare/historical bulbs and fixtures and ballasts, etc are immune to being banned and confiscated. The crap I am hearing the through the grape vine is scary. Because they have "dangerous" mercury (liquid mercury is really NOT that toxic at all you can swallow it and (...) it out usually with zero ill effects) in them, fluorescent and HID lamps and neon signs with mercury tubes, will be targeted, as will PCB capacitor and some with it in the potting tar, ballasts (GE's had it in the potting) and there is ZERO---REPEAT ZERO evidence that PCB's cause cancer in humans--fact is they DON'T, but Monsanto or some other corrupt chemical company wanted to replace PCB ballast that last forever, with something else like DEHP (also used as a plasticizer in soft vinyl) which is less stable under heat and has a lower dielectric strength, insuring capacitor and ballast failure to sell more ballasts. I have well over 100 vintage preheat ballasts with PCB's in them, so they will crucify me for having them if they go this far. Be wary, folks! If we kill globalism, and the NWO, and get companies making incandescent bulbs to kill off most of the LED craze, we will be OK. If not, your bulb and fixture collections will become contraband. DAVE---those old GE 60A/IF's are things of great beauty! I have a pillow from 1970 with a fascimile of the then current GE 100 watt soft white Q coat sleeve, and this pillow is a rarity and is sealed in a vinyl zipper bag to keep it safe. Same graphics but a white and blue instead of blue and yellow sleeve, and it depicts the 2 pack. I may have a mint pack or 2 of this era GE's lying around. They are beautiful lamps, and the short neck vacuum 25A/W Q-Coat soft white lamps are some of the most beautiful bulbs ever made, with the beautifully perfect C-9 filament showing through the coating as a fat, wide soft glow but you can see the filament form clearly---the medium neck 40A/W's were this way, too but gas filled. Lovely lamps. MERRY CHRISTMAS! Inside frost or fake silica frost? You see the bulb I was holding in the other pic? Real frost.